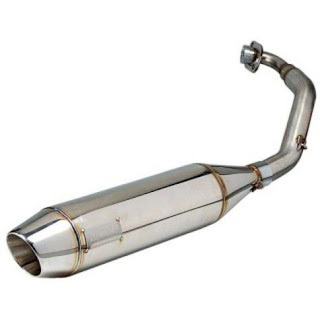 Each motor vehicle must have exhaust gas absorbers that the majority is called the exhaust. Especially on two-wheeled vehicles, this part is very visible to be part of a motorcycle. And for now, the exhaust has a number of different models and shapes. This is because to get the power and also the display. But beyond that, what exactly is the function of this motorcycle exhaust? From some information that has been collected, the exhaust has many functions for a motorcycle. Because a motorcycle engine uses a combination of technology or blasting fuel to be converted into motion. The explosion must have sounded loud enough and disturbing. For that need part to meredammnya called exhaust. Damping his own voice also varied, there is a setting with a sound that is still a bit loud but 'melodious'. These exhausts are usually used for motor sport or for racing. As for very slow damping, usually for a standard motor manufacturer usually has a voice that is slow enough even barely audible. No doubt because the exhaust is to muffle, so inhibit the exhaust gas burning engine. Damping makes engine power is reduced. But with the right setting and the exact calculation, the exhaust can actually be a booster of motorcycle engine power. For exhaust gas dampers that can boost the power of this motorcycle engine is usually called the racing exhaust. And usually have a louder voice roar compared to the standard exhaust of the manufacturer. For the current era the latest exhaust technology already uses catalityc converter that serves to help convert exit carbon through motor vehicle exhaust. This can help to improve the efficiency of exhaust emissions released and can reduce the increase of air pollution. Motorcycle exhaust design view that continues to grow to make this part not only has a technical function as well as above, but also as an attractive vehicle display booster. Especially for motor modifications, the exhaust gas absorber is never missed to get a touch of custom, not infrequently also replaced with part variation.